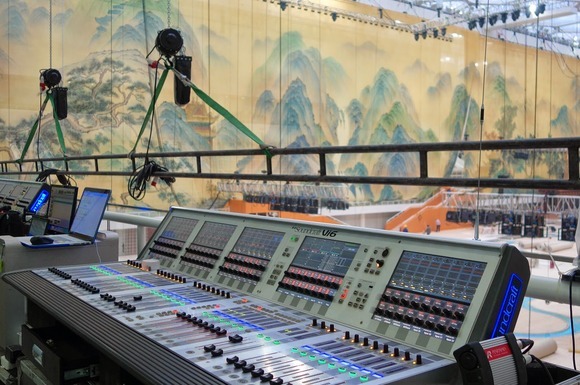 BEIJING, China – In an effort to support the most influential economic forum in the Asia-Pacific region, local HARMAN distributor ACE recently provided sound reinforcement for the welcome banquet of the Asia-Pacific Economic Cooperation (APEC) forum in Beijing. ACE supplied a full range of HARMAN audio equipment and technical support, featuring a JBL VTX line array system, Crown I-Tech HD amplifiers, Soundcraft Vi6 mixing consoles, and BSS BLU-800 signal processors. Ten national Chinese music performances were the highlight of the evening at the Beijing National Aquatics Center (Water Cube), where the banquet was held. Originally used for the 2008 Summer Olympics swimming competitions, the Water Cube is now used for grand theatrical events. On November 10, 2014, it was the perfect venue to welcome international VIPs for the 22nd APEC Economic Leaders’ Meeting. To support this unique event, ACE supplied eight VTX V20 loudspeakers and four VTX S25 subwoofers for the main PA. In addition, ACE also provided 10 VTX F15 loudspeakers, 12 VTX F12 loudspeakers for stage monitoring and distributed fill, complemented by four VTX F18S subwoofers for outfill. The system was powered with 16 Crown I-Tech 4x3500HD and six I-Tech 12000HD amplifiers, and processed with eight BSS BLU-800 signal processors. Finally, at the heart of the audio setup were two Soundcraft Vi6 digital mixing consoles, providing the technicians with a stable and secure mixing process. The banquet’s dazzling fireworks and lighting effects were matched only by the high performance PA system. Equipped with the revolutionary D2 dual drivers, the VTX V20 loudspeakers pushed clarity to the extremes as they delivered pure and unadulterated high frequencies at any output level. As always, ACE’s outstanding professionalism and seasoned technical team ensured a beautiful audio-visual feast throughout the night.